Parking: this can be difficult on a Saturday. Please don’t try parking in the churchyard if the gates are open Firstly it clogs up the churchyard and makes it very difficult for those with cars that are meant to be in there to get in or out; and secondly you are likely to be locked in there if the last of the locals to leave doesn’t recognise the car(s). There are few public car parks nearby: Merstow Green which is the large open area directly across the road from the Church Gates in Vine Street and its adjoining long-stay park with a coach area; Riverside Shopping Centre multi-storey is close to the Tower and is reached by driving over the Workman Bridge (the older of the two) from the SE side of the town; and Oat Street car park, which is bounded by Oat Street and the one-way system of Swan Lane and Mill Street. All of these charge. There is free parking on the sides of Vine Street and High Street but these are mostly for 30 minutes; and you will be lucky to get one of these slots on a Saturday unless it is late afternoon. Tower access etc: the entrance door is in the south wall. Go through the gate in the iron railings surrounding the tower. All ringing parties are met so there’s no hunting around for the key releasing clock hammers and anything else. The lower Ringing Room is reached via a fairly short spiral stone staircase. All the steps are nicely wide and in excellent condition (no worn edges). There’s a handrail to assist. The lower Ringing Room is where the bells were rung prior to 1976. A new floor was installed then to form the upper Ringing Room. This is reached via a straight set of wooden steps with handrail but tall people need to watch their head on one of the beams. Public lavatories: there are some in the public car park at Merstow Green and in Oat Street opposite the car park there. There are some at the Waterside end of the Workman Bridge too. A new public lavatory block has just been erected down Abbey Road near the Abbey Bridge (the one that looks like a coat-hanger); this is near the children’s playground - see below. In desperate (!) circumstances the person opening the Bell Tower is normally able to open up Church House for the facilities that exist in there (see below). Public eating/drinking facilities: there are a number of public houses nearby each dispensing liquid refreshment of various types. The Trumpet in Merstow Green is a Hook Norton Ales pub. There is The Olde Swanne, a Wetherspoone’s pub on the corner of High Street and Swan Lane which has a rather nice sheltered courtyard at the rear. Other pubs have various guest real ales on tap if this is your thing. Some pubs do food too from snacks to proper cooked meals. There are one or two fast food outlets in High Street. For those not wanting alcohol or fast food there is Butler’s in High Street on the same side as Barclay’s Bank. This has a small frontage but it goes back some way. It has waitress service and a wide range of meals and drinks can be supplied; from all-day breakfasts through cooked lunches to cream teas. A number of ringing parties have visited Butler’s and found it very acceptable. If all you want is a cup of tea and a cake or a scone in a cafe the Archway Cafe near Church House can serve you as can the small tearooms near Church Gates. Things do get more difficult if you are visiting early evening as many places close at 5.30pm or so. Things to see or do if you are not ringing: there is the Park next to the Bell Tower. If you have young children and wish to tire them out let them run around in this large grassed space for half an hour or so. Unfortunately the swings and things which used to exist by the boating and paddling pool have been moved next to the viaduct leading to the Abbey Bridge which is at the far end of the field next to the Park. There is a public lavatory block nearby; and it is only a short walk back along Abbey Road to the Bell Tower. 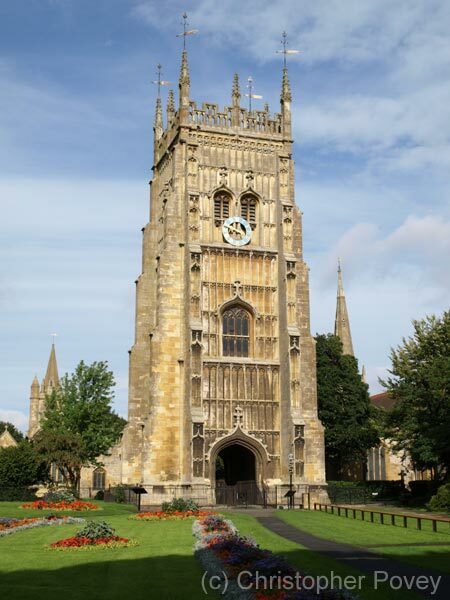 There is the Almonry Museum near Church Gates which has a very good section devoted to the once-mighty Evesham Abbey (the Bell Tower was the abbey campanile). There are the twin churches All Saints and St Lawrence which until 1979 used to serve as the Parish Churches one for each side of the High Street. St Lawrence is now with the Churches’ Conservation Trust. If you fancy a pleasant walk go down Boat Lane at the far left end of Merstow Green to the hand-hauled ferry across the Avon at the end. A longer walk can be achieved by turning left before the ferry and walking along the river bank to either the Abbey Bridge and walking back up Abbey Road or continuing along the river bank towards the Workman Bridge and walking up to the Tower through the Park. This walk will take you past Great Hampton church (1948 Taylor 8 12cwt) which on the opposite side of the river. Through the summer there are river boat rides from the Park on "Handsam Too" which is (almost) an anagram of Tom Sandham who owns it and who is a ringer at the Bell Tower and nearby Badsey. There are the shops in High Street Bridge Street and Riverside Shopping Centre but don’t expect Oxford Street. Evesham may have a glorious ring of 12 but it is still very much a rural market town!